I've let the review copies of records pile up over here a little bit lately. Not that it's a very large pile or anything and it's actually extremely helpful as they give me something to write about during these lean summer times. So, I guess what I'm saying is that if you've ever considered sending me something to review, now is a pretty good time to do that. 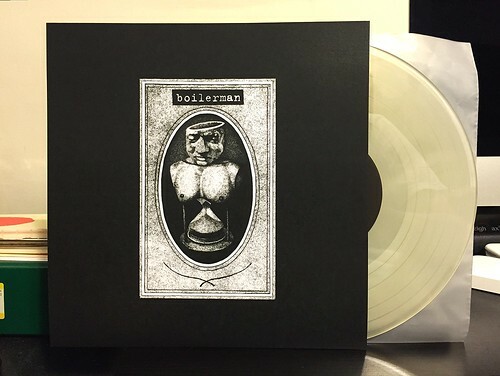 Back to the point, this self titled Boilerman 10" arrived in the mail recently and I was pretty excited about it. They're a band that I had heard a little bit about so they were already on my radar, at least peripherally. The 10" itself is a mixed bag for me. It's pretty punk rock with razor blades guitars and pounding drums. The vocals can get a little too shouty at times for my personal taste, but when the band is hitting that sweet spot, everything comes together nicely. In particular, I prefer the poppier songs on this 10" like "II" and "Weak Weak." I'm less enthusiastic about the harsher, angrier ones like bookends "I" and "VI." In general, it's a pretty fun little one sided 10". The songs are short and fast and have moments of being pretty good. I'd likely look into their next release, especially if someone had the kind heart to send it my way to review.